Previously believed to be some of the insect world's poorer flyers, bumblebees are actually capable of soaring to great heights -- like to the top of Mount Everest, for example. According to a new study in the journal Biology Letters, alpine bumblebees can sustain flight more than 29,500 feet in the air. But, although bees can fly as high as the world's tallest peaks, it's not realistic that they ever would. 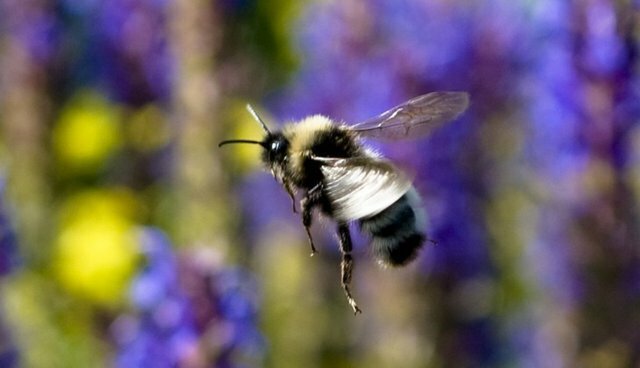 Michael Dillon, an ecologist at the University of Wyoming and the study's lead researcher, said that reaching excessive altitudes is actually more physically demanding for bees than it is for humans. "For a person to walk up Everest, it's athletically challenging," he told Nature World News. "But, it's nowhere near the effort it takes for a bee to fly there because of the oxygen demand. A bumblebee needs to supply its tissue oxygen 10-15 times that of an elite athlete exercising." Additionally, there's no motivation for the bees to fly so high in the first place: bumblebees' primary reason for flying anywhere is to gather pollen, and places like Mount Everest don't have any. But, Dillon and his colleagues found, understanding the mechanism that allows bees to reach such great heights -- even in simulated conditions like those in the study -- could inspire the next stage of advanced flight technology.